As I have to acknowledge the fact that I have no recollection of ever having seen a Bristol Britannia in commercial service, let alone having taken the opportunity to take pictures, I greatly accepted some fantastic shots made by Bryan Benn. It was also an excellent opportunity to commemmorate Invicta International. G-ANCF prior to take off from Manston to Manchester, before working a cattle charter to Italy. "Charlie Fox" is a Bristol 175 Britannia Series 308F (c/n 12922 ) and was built by Short Brothers and Harland Ltd., Belfast in 1958. Its powerplants are four 4,440hp Bristol Proteus 765 turboprops. G-ANCF taking off from Manston in Kent (UK), on a positioning flight to Manchester, from where it was going to operate a cattle charter to Italy. The cattle flights were 90% of the time to Milan in Italy and concerned 1-year old calves. It was a regular contract. On one occasion I accompanied the flight as supernumary crew: we flew to Milan with the calves, unloaded the calves, then stripped the penning and had the floors cleaned/washed down. The penning was then placed in the hold and the aircraft was loaded with (amongst other) consumable items: wooden coffins ! The aircraft proceeded to Gibralter where the goods were offloaded and we rested for 6 or so hours. We then had to position to Tangiers to refuel, then flew to Tenerife, where we again rested up for about 8 hours. The plane was loaded with fresh oranges and then via Malaga, for a brief fuel stop, we proceeded back to Luton. Thanks for reviving some good memories ! (Ops officer at both Manston and Luton, and later worked in Cargo sales at London (Piccadilly) offices). This airframe was the Britannia Aircraft Preservation Trust's (BAPT) first acquisition. 'Charlie Fox' had been stored dismantled since 1988, initially at Brooklands Museum, Weybridge, then it was moved to the Bristol Aero Collection's storage facility at Banwell, Western-Super-Mare and finally to it's current home at Kemble, Cirencester. Here a long term restoration programme has been initiated, in conjunction with the Bristol Aero Collection, with a view to rebuilding the aircraft for display in British Eagle livery by the Collection at Filton. G-AOVF (c/n 13237) taxis to a halt in front of Invicta's large maintenance hangar at Manston. "Victor Fox" was delivered to BOAC in January 1958, for use on their transatlantic passenger flights. In 1964 it was leased to British Eagle Airlines, who had it converted to cargo configuration by the addition of a forward cargo door in 1968. After returning to BOAC, it was sold on in 1970 to Monarch Airlines, and leased it to Donaldson International. In 1972 it was bought by IAS Cargo Airlines, and later leased to African Safari Airlines and Invicta International Airlines, who later bought it. It was leased to Redcoat Air Cargo in 1979, and to IAC Cargo for 5 months in 1981, who registered it as 9Q-CAZ. It was subsequently placed in store at Manston, until sold to Air Newland airline Merchant Air, who flew it to Southend pending overhaul in February 1983. Merchant Airs plans were abandoned in early 1984, and it was donated to the Museum, flying to Cosford on 31st May 1984. 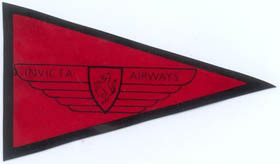 Ian Hepplewhite sent me this insignia of Invicta Airways. He came across it accidentally while searching among a few items given to him around 1960, by relatives living in London. This particular item was a window sticker. "I found your website and it certainly brought back some memories! My uncle was the Commercial Director for Invicta (through IATS) and I was his secretary! I flew to Milan on Charlie Foxtrot - it's a claim to fame that I flew with 250 baby cows!!! Len Whitite (wrong spelling!) was the Captain and I remember that the Loadmaster provided a tasty in-flight meal! Invicta Airways was founded in 1964 at Manston in Kent, UK. Two Vickers Vikings and two Douglas DC-4s were initially used for charter flights on behalf of touroperators; flights commenced in March 1965. Invicta also acquired rights to operate cargo flights. 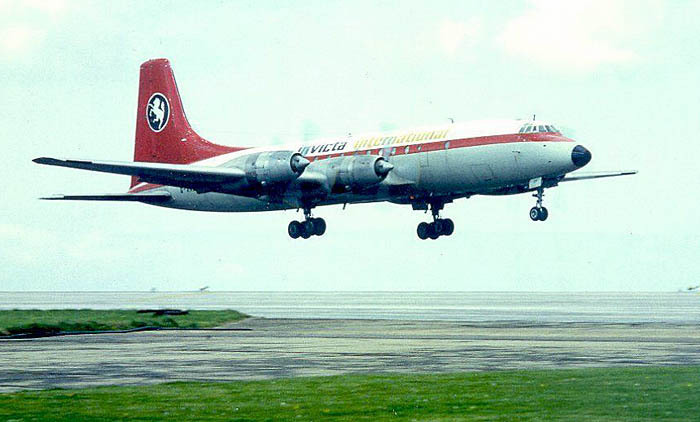 At the end of 1968 Invicta Airways was merged with British Midland. But the company's founder bought back some of the DC-4s and set up Invicta Airways 1969 Ltd, which was renamed Invicta Air Cargo in June of 1969. Routes to Europe, Africa and Middle East were flown. In 1970 the first Vickers Vanguard joined the fleet, 2 more joined the year after. 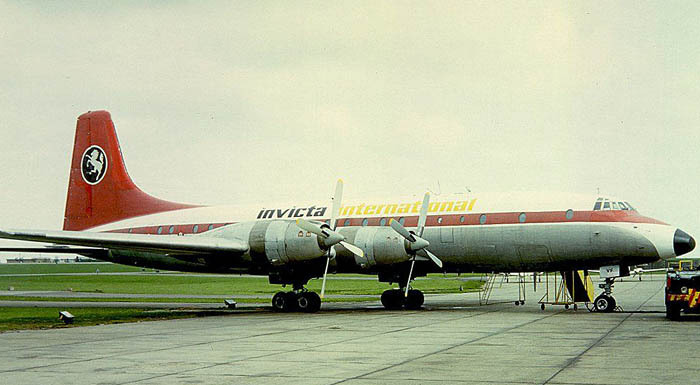 These were widely used on the route Luton to Dusseldorf for military charter and student flights, using the name Invicta International Airlines. At the beginning of 1973 the whole Vanguard fleet was grounded on orders of the leasing company due payment irragularities. The shipping company European Ferries took a 70 percent holding in Invicta and leased the Vanguards back. Flights were restarted but in April of 1973 one of the Vanguards crashed near Basle. Two Boeing 720Bs were acquired but only one flew for Invicta, the other one flew with Somali Airlines. Invicta took on more contracts and 2 Bristol Britannia 312's joined the fleet. It was curtains for Invicta by the end of 1975, when the company was sold by European Ferries to Universal Air Transport Sales. Universal Air Transport's purchase included Invicta's facilities at Manston (a hangar, passenger terminal, freight shed, lairage pens, an office block and a warehouse centre). Wing Commander Hugh Kennard remained as Managing Directorof Invicta Int'l - while also being the Chairman of Universal Air Transport Sales... and operations were once more started. For this a leasing agreement was reached with IAS Cargo Airlines whereby Invicta would operate 2 of IAS' fleet of Britannias; flight operations started on 03Jan76, with livestock charters from Manston to destinations in Europe, Middle east & North Africa. "I was stationed at RAF Manston from September 1979 - 1982 and well remember their operations, often to Manchester and Milan. I would like to comment on the end date for Invicta International - although I cannot give the exact date, they were still flying with G-ANCF up until around 1981. I believe they also had a second Britannia, G-ANCE, too." But by 1981 things came to a definite end. In that year only Bristol Britannia 308F G-ANCF (c/n 12922) was listed in the fleetlist and plans to acquire jet equipment never came to fruition. "I have funny memories of Invicta Aircargo from 1972; or was it 1973? I worked for a handling company Nurminen Air back then and Invicta flew in Ford car parts with a DC-4 every week. We told them the way to the airport restaurant, but they left the electricity switched to battery and we had some trouble switching it over to ground power, so as not to drain the batteries. Next morning they were supposed to fly back but no pilots appeared. We called the hotel and they had checked out. Finally we found them in the airport restaurant. We pointed out an oil spill under the landing gear but they did not seem worried. They took off but soon did a fly-by. We called the tower and asked what that all was about. "They just wanted to make sure the landing gear was really out". And so they flew back to England with the landing gear out! I later heard that they went bankrupt. Must have been the high fuel costs."